Caricature Gift Certificates - Last Minute Gift Saviour! 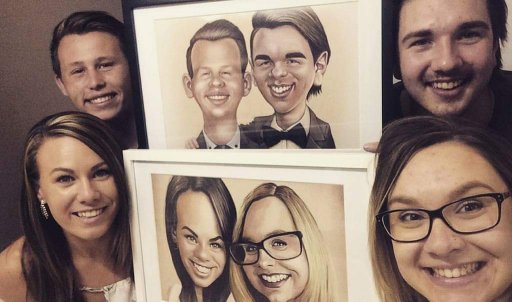 Give an exclusive caricature gift for a wedding, birthday, retirement or even as an award or other gift giving situation. Let your gift recipient choose which talented artist they like and allow them to determine their preference for what is in the gift caricature image! Give a caricature gift certificate. The perfect solution for an urgent last minute gift need. The recipient visits the site, browses the artists and places an order with the artist who's style they like. They then enter the certificate number into the voucher field and the amount is deducted from their order (back to $0 if they order that exact amount). If they choose a higher value product, then the voucher amount is deducted from the total. Please use the currency of your purchase from the drop-down selections below. After clicking 'Complete Your Order' you will enter the cart. Here, in the comments field, please include the recipient/s name/s for inclusion on the certificate. Note that discounts apply from 2 or more people and this is reflected in the price. On processing of your order the certificate will be emailed to you as a PFD document ready for printing or forwarding by email. Please allow up to 24 hours to receive the certificate. Note: Gift Certificates are not refundable, nor returnable and cannot be redeemed for cash. Pay by Credit card or PayPal Note! If paying by credit card your statement will show Plus One Marketing. Pay by Credit card, PayPal Note! If paying by credit card your statement will show Plus One Marketing.